Mixed by two of the scene’s leading DJs and tastemakers, the 2CD mix, ‘All Gone Pete Tong & Tensnake Ibiza 2014’ features cuts from the likes of Basement Jaxx, Oliver $, Damian Lazarus, Seth Troxler, Harry Romero and many more. In addition to many of the biggest dance records of the year, also included are two brand new and exclusive tracks: Coldplay ‘Midnight (Tong & Rogers Mix)’ and Tensnake ‘Pressure (Special Request Remix)’. Pete Tong is a pioneer who played a key part in the original explosion of dance music. Acclaimed by some as the 'Global Ambassador for Electronic Music', his BBC Radio 1 radio show (now in its 22nd year) is probably the most iconic dance music show in the world. Tong also continues to DJ, playing upwards of 80 shows per year around the world both as a stand-alone DJ and with his All Gone Pete Tong club brand which is regularly seen hosting arenas at festivals. Tensnake has risen from relative obscurity in just a few short years. Following singles (see ‘Coma Cat’ and ‘See Right Through feat. Fiora’) and remixes of the likes of Azari & III and Little Dragon, his debut album ‘Glow’ was released to great reviews. From the pop-leaning euphoria of opener ‘Hausch’ by Andmin to the creeping, bass-heavy paranoia of Maceo Plex’s remix of Gusgus ‘Crossfade’, Tong’s mix encompasses an extensive variety of dance music. Tensnake’s mix is equally good, with the garage bump of Aster ‘Cielo (Bicep Remix)’ and Special Request’s remix of Tensnake’s own ‘Pressure’ standing out as highlights. 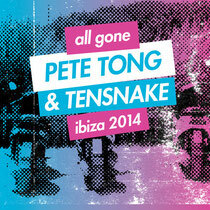 ‘All Gone Pete Tong & Tensnake Ibiza 2014’ is the latest in the ‘All Gone’ compilation series, with previous guests including Skream, Groove Armada and Book Shade. It’s out 13 July (2CD and digital) on ITH.